Heat oven to 425 degrees. Layer pancetta, onion, leeks and cheese evenly over bottom of pie crust. Then mix together eggs, onion, garlic, chives, milk, salt and red pepper flakes then pour over other ingredients in pie crust shell. Bake for 15 minutes. Reduce the heat to 300°. Bake quiche 30 minutes longer or until knife inserted in center comes out clean. Let pie stand for 10 minutes to cool before cutting. Serve with a salad of your choice! 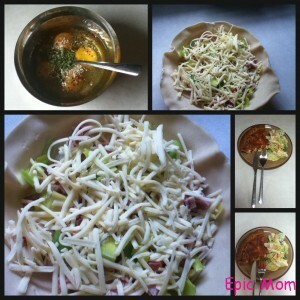 nice and simply and sounds like a delicious dish:) Thanks for sharing this recipe post! Grilled Thai spicy beef…yum! Thanks for posting this awesome recipe Jerry; I can’t wait to see what you come up with next. I love me some quiche!!! Thanks for sharing. Hey Wanda, I absolutely love accessories so thanks for those great creative ideas on how to wear a scarf!!! Looks like a great recipe to tryout with my 12yo. She loves to bake. Thanks! My pleasure Kanesha. Btw, your multi-generational family is absolutely beautiful! Thanks. Happy weekend (my last day at work). YAY!